Having introduced the gargantuan Obsidian Series 900D and the micro-ATX Obsidian Series 350D, it was clear that Corsair would flesh-out its high-end chassis range with other new additions. Today, the manufacturer is filling the void between super-tower and midi-tower with the arrival of the full-tower Obsidian Series 750D, priced at $160. Look familiar? 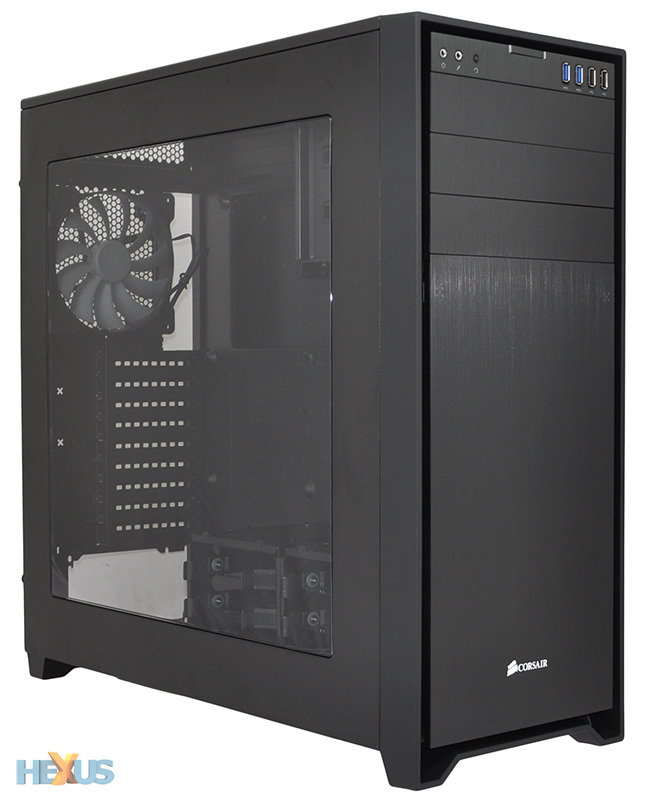 That's because Corsair's design ethos for the Obsidian range has been kept intact. The 750D, at first glance, is practically a smaller version of the top-of-the-line 900D, or a bigger version of the 350D, depending on how you look at it. Either way, the size and model number is significant. 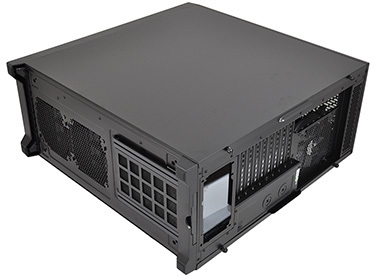 As a full-tower solution, the 750D is the chassis that replaces the award-winning 800D and 700D. It's what enthusiasts have been longing for since 2010, and if you opted not to stump up the cash for the £300 Obsidian Series 900D, you're probably going to be glad you waited as the 750D is less than half the price. The $160 MSRP - which ought to signal a UK street price of around £130 inc. VAT - is hugely significant and suggests that Corsair is bringing the Obsidian Series down a notch to be price competitive with the likes of NZXT and Fractal Design. 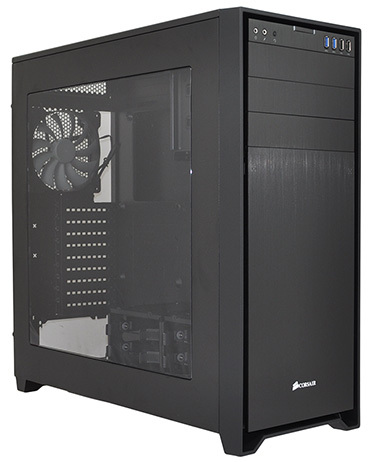 Indeed, this is the most affordable full-tower Obsidian that Corsair has ever released. 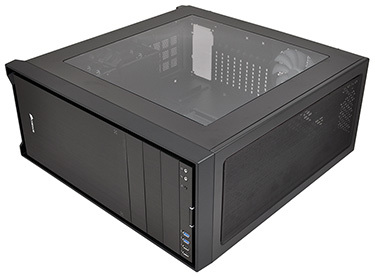 That's good news for consumers wanting a high-end Corsair chassis without having to break the bank, but on the flip side, the 750D arguably isn't as innovative as Obsidians of yesteryear. Whereas the Carbide Series range has shown a willingness to try something different, the latest Obsidian chooses not to stray from familiar ground. The 750D carries over the external aesthetic of this year's other Obsidian chassis, so while the chassis doesn't look particularly fresh nor exciting, it remains classy and familiar. The side panel has the customary large window, the colour is matte black throughout, and the floating brushed aluminium front fascia still does a good job of giving the enclosure a premium feel. There's a lot of chassis on offer for $160. Measuring 560mm (h) x 235mm (h) x 546mm (l) in size and weighing almost 10kg, the 750D isn't quite as tall or deep as the older 700D, but it remains a formidable frame with plenty of room for extreme hardware. 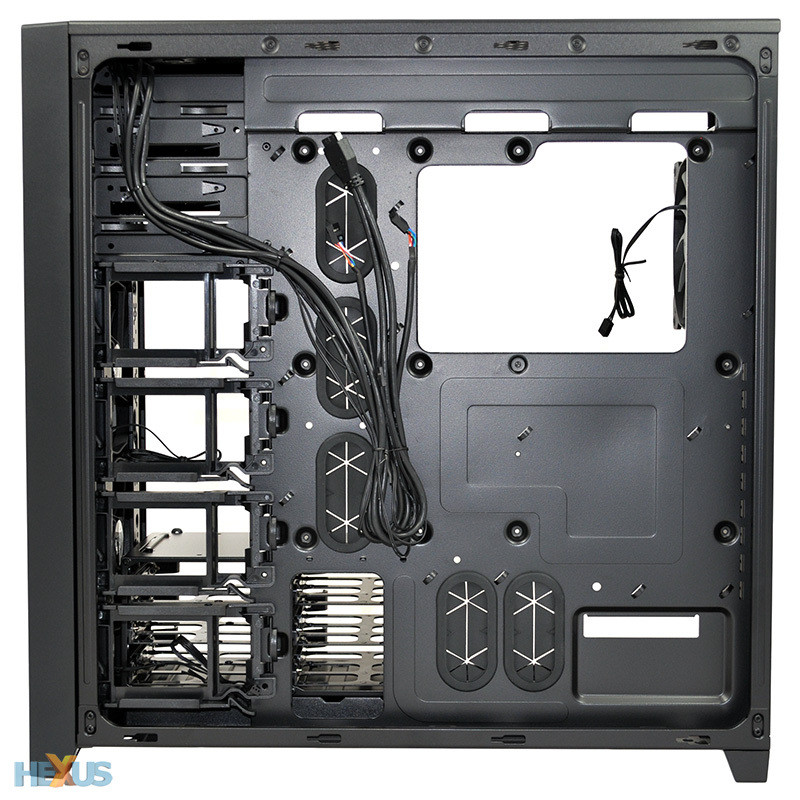 A total of eight fan mounts are available - with Corsair bundling three 140mm blowers as part of the bundle - and there's support for up to three radiators. Cooling potential certainly isn't lacking. Neither is storage, come to think of it. 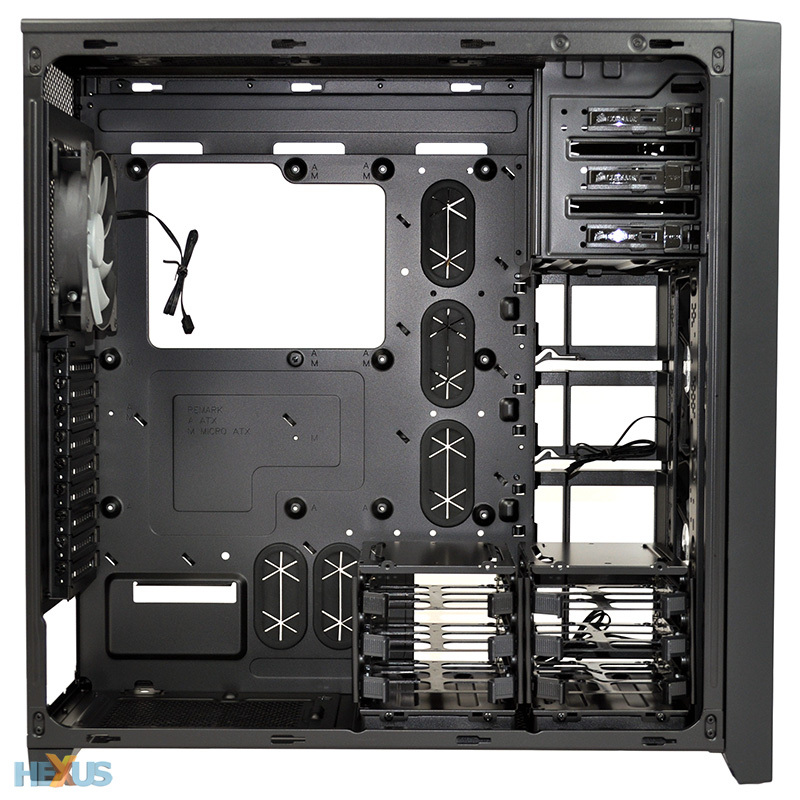 Corsair has a total of 10 tool-free bays available, of which four are 2.5in bays positioned alongside the motherboard tray, and six are 3.5in bays spread across two modular cages. 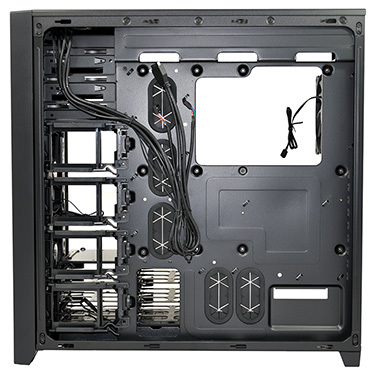 Nine expansion slots, three 5.25in optical bays, support for a Micro-ATX, ATX, E-ATX or XL-ATX motherboard, and ample cable-routing opportunities. 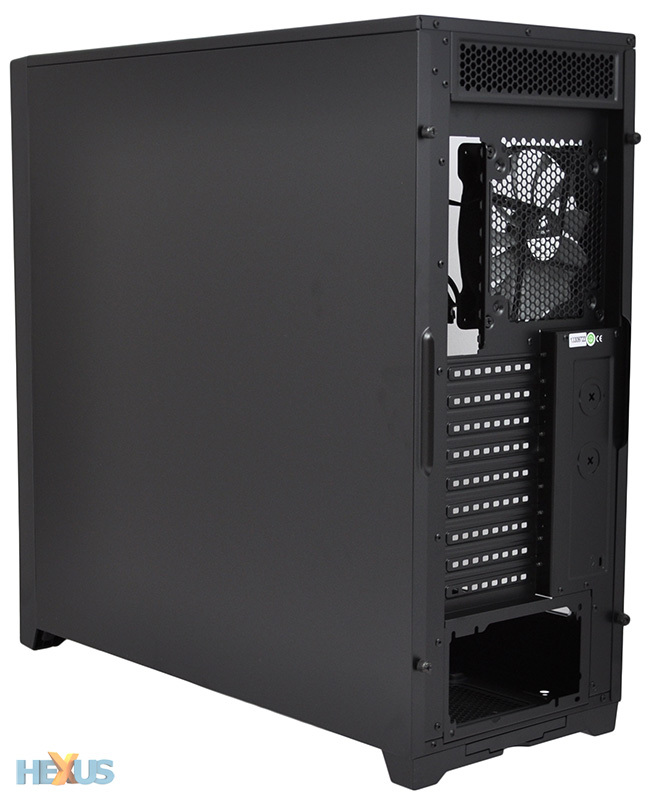 The 750D has the makings of a very capable full-tower chassis, but what's it actually like to work with?